I am Dr shivShankar Diggikar working Pediatrician from Bengaluru . I met Samarth who is now 3 years with cute smile. 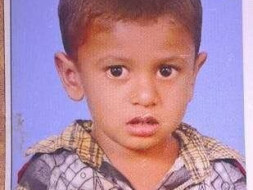 He can't hear due to deafness from birth and can't speak as well .His parents noticed it when he was 6 months and they are from a small village in Gulbarga. They are farmers and totally helpless. As I am from Gulbarga but work in Bangalore I saw the kid fortunately and felt very disappointed to see him helpless at 3 years. 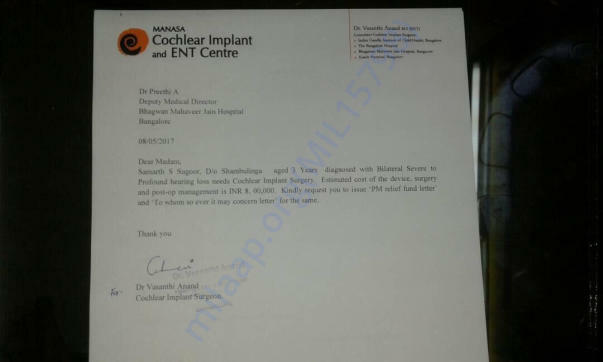 I tried my best to get him get hearing implants but the surgery cost 10 Lakhs . I am ready to give 50k, but it's of no use .I tried PM funds ( assuming he will get 3 Lakhs) and consulted many foundations but no help . If surgery is not done within next 6 months or Max of 1 year, as much time is already wasted he can't hear and speak for rest of his life. Outcome is good only if it's done before he reach 5 years.That is why I am trying too hard for it . Plz plz donate him listen to the world plz I humbly request. hope you all love to see his pic when he hears for the first time . We are withdrawing the funds donated to help Master Samarath get speech and Language assessment done for 3 months before he gets his surgery done. We thank all the donors for the immense help and will be grateful to them. There are still few days remaining for the fundraiser. I am really thankful for your Immense support so far. Samarth is doing ok his check ups have been completed and we are waiting for the PM fund to be sanctioned ASAP so that he can get his surgery done within next 2-3months. We are very grateful to all the supporters who shared or donated to Master Samarth. We had to fix the date for implant surgery and try to get an earlier date for him . Hope to get it done soon. I request for the continuous support for Samarth from all the readers . My son's name is Samarth too - hope this Samarth gets better soon!